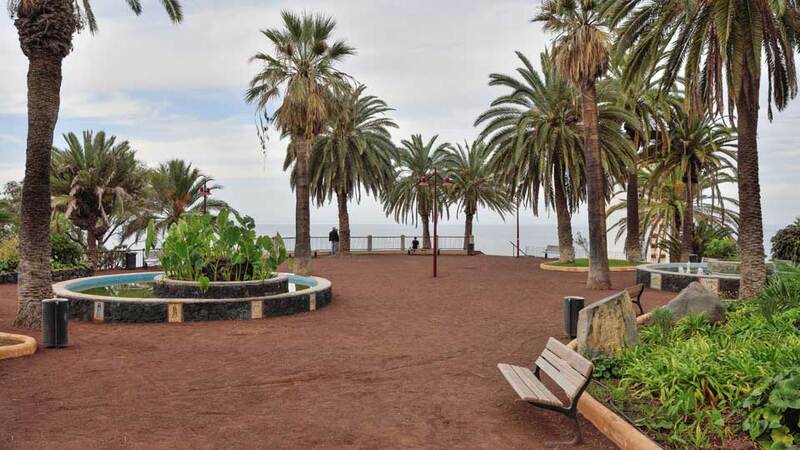 An often-overlooked park in the heart of Puerto de la Cruz, Parque Taoro is a delight to anyone who finds it. It is a well-manicured recreational area covering 100,000 square meters of a botanical garden where cascading waterfalls and landscaped gardens welcome visitors upon their arrival. Paved pathways weave through palms, flowers, and pools, some leading to views over the city. This haven served as a residential area for Puerto de la Cruz’s select foreign community and is now the largest green area in town. With shades provided by the trees, Parque Taoro is perfect for a midday stroll. This lush green corner of the island offers a great way to get a taste of the countryside without the need to get too far out of town. Reachable by foot from the town proper of Puerto de la Cruz, the journey to Parque Taoro involves a bit of a climb, including a 250-steps stairway. Even so, tourists and locals alike brave the assault on a regular basis to take in the park’s invigorating atmosphere. Parque Taoro is divided into three sections: Los Jardines de La Atalaya (Vantage Point Gardens), Los Jardines del Taoro (Taoro Gardens) and Camino de la Sortija (Ring Road). Los Jardines de la Atalaya, the best-tended and most luxuriant part of the park, is crisscrossed by pleasant paths and stairways which meander between springs and waterfalls. This part of the park offers plenty of great walking opportunities. Strolling around, visitors will pass by charming gazebos, bridges, stunning terraces and a playground for kids and kids at heart. A series of ceramic murals about the Canary Islands stand out among the greenery. At the top of the hill, dominating the whole town is the hundred-year-old English-style building. Once a holiday rental, Gran Hotel Taoro was the first magnificent hotel built in Spain. Designed by French architect Adolph Coquet and opened to the public in 1890, this building is of architectural and historical value. This hotel was turned into a luxurious gambling casino until it was closed to in 2007. The third section of the park is the Camino de la Sortija, a place of special memories for the locals. The Ring Road is where various festivities and town contests were held. With its vast land area, Taoro Park sure knows how to keep its visitors occupied for a couple of hours. From walking trails, amazing flora and fauna to awesome lookout points, there is always something fascinating at every corner. Whether visitors aim to feel closer to nature or have a quiet break from the busy city life, a stroll at Parque Taoro is always a good idea. The well-manicured gardens and lush subtropical vegetation are a cure to wary hearts and spirits of its guests. Everywhere, the flowers of the bougainvillea glow and form a splendid, colorful picture. Sounds of insects fill the air and guests can observe countless butterflies and dragonflies hanging around. In front of Gran Hotel Taoro is a huge waterfall that plunges over generously laid out terraces. The water flows through beautiful cascades and forms small waterfalls. The ponds beneath are home to an infinite number of lovely water lilies. Visitors can cross some small bridges to get to the most hidden corners of the park. On the upper terrace, visitors can savor unrivaled views of the town and the Atlantic Ocean. This lookout, Mirador Dulce Maria Loynaz, is named after a Cuban poet who lived in and was inspired by Puerto de la Cruz in her craft. Risco Bello is a charming little tea garden with a bar and cafe. Here, visitors can cool off after a few hours in the sun at Parque Taoro. This place offers delicious coffee, tea, and fruit juices as well as mouthwatering cakes. Guests can enjoy their snacks while taking in the countryside feel of the surrounding park. Hidden among verdant vegetation is a century-year-old Anglo-Saxon style Anglican Church. It is built of stone, with neo-Gothic façade and stunning stained-glass windows. The reason for its existence is that this area of the ​​town was where the British settled in during the 17th century. This church was their place of worship. 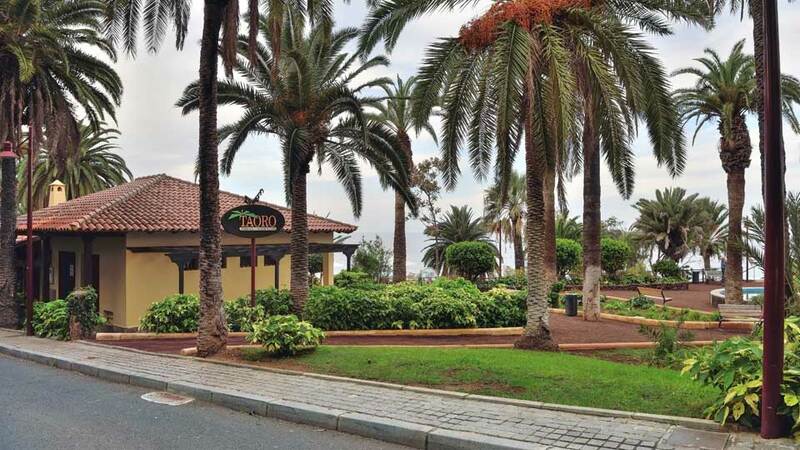 Situated next to Parque Taoro is Jardin Aquatico, another must-visit site in Puerto de la Cruz. Smaller than Taoro, this garden takes only about half an hour to walk around. Visitors can enjoy the lovely water gardens with vibrant flora and fauna around the park. Perhaps the best time to visit Parque Taoro is in the afternoon. This way, visitors will have time for a leisurely stroll around the park and catch the sunset at one of the lookout points. Situated in the northwest of Tenerife, Puerto de la Cruz is blessed to have one of the most beautiful sunsets on the island. Witness the majestic sun bid goodbye to the Atlantic Ocean and admire the dramatic colors of the sky. Then, head back down as the park starts lighting up for the evening. Getting to Parque Taoro is not, well, a walk in the park. Even if it’s less than a kilometer away from the town center, it involves a strenuous uphill walk along Taoro Road. Alternatively, visitors who wish a more convenient transit may drive on their own to Parque Taoro. From Calle Salto Barranco, they can take Taoro Road and General Puerto Cruz-Arenas/TF-312 motorway. They may use this GPS coordinates: 28°24’39.6″ N 16°32’53.4″ W. This journey takes less than five minutes and there’s ample parking space near the park. The park visit is free and it is open to the public all year round from 6 am. Parque Taoro is certainly not the most practical suburb because of its uphill location or for people who prefer beach holidays. However, the city life, even if tourists are on holiday, can be a bit too overwhelming at times. A walk in a park once in a while is always a great idea. This green lung of the town will remain a special place for those who love nature and tranquility.